Goodbye, 2015! If we didn't have our year-end events as evidence (including Spin For Hunger and Texas Hold 'Em & Casino Night), we would have trouble believing 2015 is over! To kick off the season, our friends from Grassi & Co sponsored a massive PB&J Day where over 200 employees made 15,000 sandwiches to be distributed to the food pantries we help. 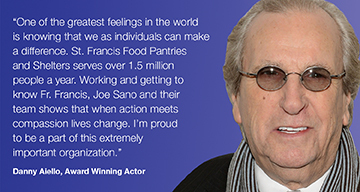 On Thursday, November 5, 2015 St. Francis Food Pantries and Shelters held its Sixteenth Anniversary Doodle For Hunger Celebrity Art Auction at Pier Sixty / Chelsea Piers. Hosted by Fox 5 NY's anchor Ernie Anastos, the Guests of Honor were Regis Philbin, Famed Television Host and Danny Aiello, Actor and Musical Guest who sang a medley of songs to over 700 guests. 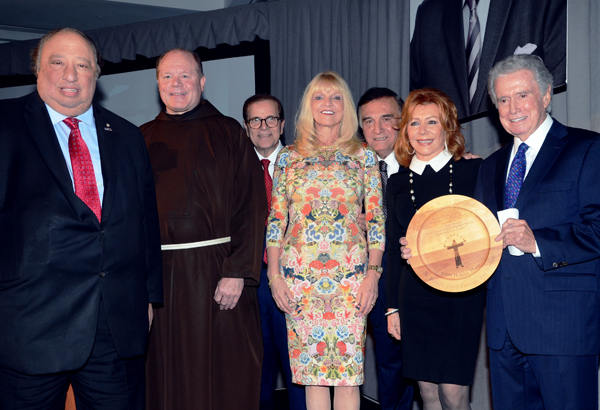 Margo and John Catsimatidis were the Presenting Sponsors of the evening that raised more than $700,000 to benefit St. Francis Food Pantries and Shelters. Original, signed works of "Doodle" art created by Donald Trump, Carol Burnett, P.C. Bill Bratton, John Travolta, Helen Mirren, Judge Judy, the late Wes Craven, Alanis Morissette, Tyler Perry, Kristin Chenoweth and Lin-Manuel Miranda were among the Doodle offerings! We distributed over 7,000 turkeys (throughout more than 45 locations we support) to feed over 28,000 people this year for the Thanksgiving holiday. In addition, we gave out over 200 Thanksgiving Meal Baskets filled with a canned ham or a voucher for a frozen turkey to prepare a delicious holiday meal. JPMorgan Chase recently sponsored a luncheon for the seniors at Encore Community Services, much to everyone's delight. Our Holiday Drives are currently in high gear! As we welcome 2016, stay connected with us on Facebook, Twitter, Instagram, and Vimeo.